Nigerian Dwarf Goats are a Lifestyle, a Passion and a Necessity. They provide us with delicious cheese, creamy milk and delightful companionship. They also keep us laughing with their innate charm and impish actions. We didn't "Intend" to be personal servants to an array of Caprines but here we are at their beck and call. Marybeth and George discovered they had a mutual love of goats. On George's birthday Toehead Riley came home to live with them. Riley soon became known as Rita and she and George were very happy together. Fairly soon Toehead Maggie joined the tiny herd of two. Maggie insisted on being Herd Queen which was ok with Ms Rita, she had her George to share PB&J's with on the back porch. Anyway, Lilac and Maggie had kids every year after that and the kids kept staying! Well, eventually some left for new homes-like me. One day MB decided to try milking Lilac. Neither she or Lilac were exactly skilled at this but some milk was obtained. George was not enthused about this new endeavor knowing that there was a lot of work to do with all the sheep-don't need one more thing to do. Then he tried a sip of the milk. That was it. The true beginning. The milk was sweet and rich-perfect for cheese or better yet Ice Cream! Now the herd has lots of goats with Championship legs, some already got their titles and Superior Genetics too! 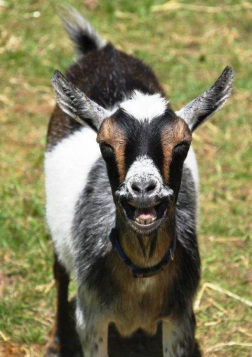 Lilac milked over a 1260 pounds in 2014-not bad for 'pet goat' huh? She had her eye on the Top Ten for a while now and earned her spot for that lactation. Proud of my sister ya know? Maggie still has her tiara on-she refuses to give up her herd queen status. She says, "It is good to be queen especially a Dairy Queen"
All text, photographs, records and opinions are the personal property of Elfin Acres Nigerian Dwarf Goats. Please obtain written permission prior to borrowing anything from this site.